By the time a census was taken in 1680, some 500 of the 20,000 white people on Barbados were Quakers, Gragg says. Ultimately, the Quaker movement on Barbados “ended with a whimper,” Gragg writes. 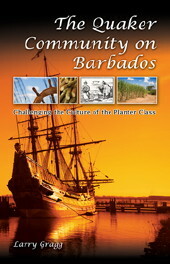 “The Quaker Community on Barbados” is Gragg’s second book about the island. His first, titled “Englishmen Transplanted: The English Colonization of Barbados, 1627-1660,” was published in 2003 by Oxford University Press. Gragg says the research he conducted for that book led him to delve into his study of the Quakers on Barbados.